The largest collections of Norval Morrisseau paintings and sculpture by Legends in the world. 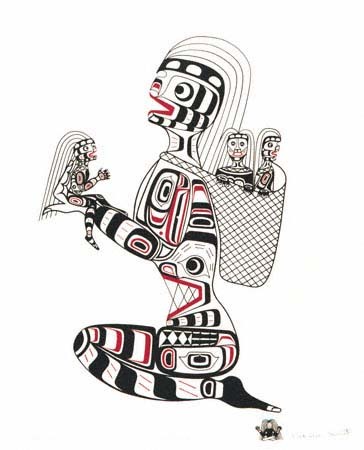 Represented here by Noreen, Richard, Stanley, and their father, Henry, the Hunts are Kwa-ulth of the Kwakiutl Nation. Their prints are $150 and up. Noreen Hunt is one of the few women working as an artist among the Kwa-gulth. The Cannibal Woman is a mythical creature, once human, which frequents forests. There are many stories of her antics, but only a certain chant or help from the goodly Sisiutl can overcome her. Richard Hunt was born a Kwa-gulth of the Kwakuitl Nation in Alert Bay, April 1951. He was tutored in his culture and tradition by his family. A master of carving, painting and potlatch dancing, he was awarded the coveted title, Hamalsa (Wild Man). Stanley Hunt is a mask carver and printer. The phases of the moon are very important in the Kwa-gulth lifestyle. Henry Hunt, born a Kwa-gulth in Fort Rupert, married the daughter of the legendary chef Mungo Martin. 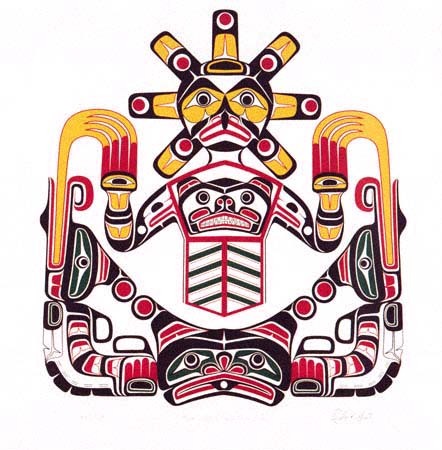 He is a renowned carver, graphic designer, and potlatch dancer.